The daffodils are out this week. Spring is officially here. Never mind the groundhog (probably took one look and said “Okay, bad dream, back to bed.”). When the daffodils bloom it’s time to put the skis away and start buying tulips for the coffee table. Tip: if you put a penny in the vase, the tulips won’t wilt. I have a bit of a fraught relationship with the plant world. My mother and my sister are plant fanatics – on family hikes they’d constantly be stopping to identify flowers. If you saw an orchid, the day was made. My sister has since made a fantastic career out of the activity, traipsing around in jungles and deserts and swamps in search of stuff that nobody has named yet and getting it on the books before it’s too late. She’s amazing. We’ll be on a walk somewhere, and she’ll suddenly screech and bend down and dig out some tiny miniscule clump of moss or something and say, “Look! Microlittleus mossiporous! I haven’t seen this since 1986 on my trip to eastern Timbuktu!” while prying the poor little thing’s innards apart and examining them avidly. No, you can’t just walk from point A to point B with these types. The ground is literally covered with distractions. Come to think of it, I wonder if my decision to major in philosophy in college might not have originated in this adolescent fulmination against arranging nature into neatly-labeled categories. Clearly, if there was a family plant-appreciation gene, I didn’t inherit it. There are a few varieties that I manage to keep from killing – they’re the ones labeled “hardy” at the nursery. 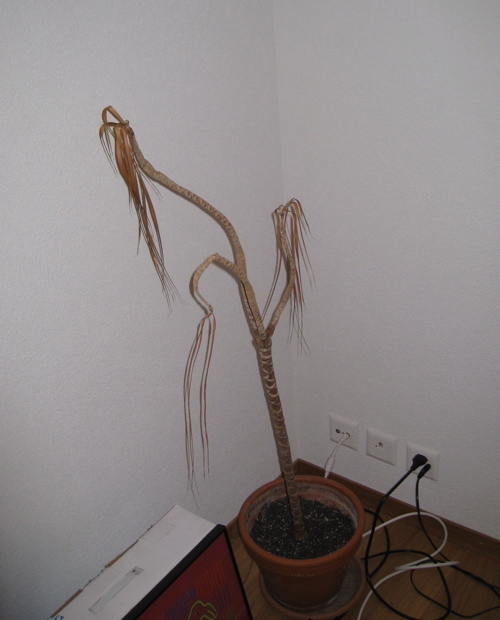 The poor plant in our study has been dead for at least a year. It stays there, listing gently to one side, a constant reminder to me to water the other, luckier specimens downstairs. I didn’t compensate for my botanical deficiencies through marriage, either. My husband’s idea of gardening is opening the phone book to “landscaping”. “We need to keep the economy moving, Mary,” he’ll say. He’s one of the only people I know who can make shirking a job look like public service. When we moved into our house three years ago and had to plan a garden from scratch, I wanted a garden that took care of itself. The landscapers put loads of little baby plants in, promising me they’d cover the ground eventually, and then left. I spent the next two years in an all-out war with the hordes of weeds that invaded my vulnerable little plantings. The first two tons of weeds were kind of rewarding. I’d yank the things out by the roots, pleased with myself for knowing what was a weed and what wasn’t, pile them in the car and haul them out to the village dump. But soon every time I went out the front door I’d see weeds. Everywhere. There is one kind that won’t pull out. It breaks off at the base, leaving the roots to sprout new leaves. It drives me mad. I’ll be going out for a jog, and I won’t get past the driveway. I go back for a trowel, just to get that one weed. Then I see another. Then another. Pretty soon there’s a pile two feet wide on the driveway and I have a killer backache. I have to go in and get a beer and recuperate. Nobody else showed the least interest in either the garden or the vegetables. When I came home after a visit to the US, the beautiful little cherry tomatoes were rotting on the vines, their poor stems choked with weeds, the snowpeas dessicated and crumbling, the lettuce sporting very unlettucy-looking flower stalks, the leaves all gone leathery and tough. The zucchini was the size of my lower leg. Oddly enough, I couldn’t bring myself to care that much. I took a picture of Luc holding the gargantuan zucchini and then did damage control. I didn’t reproach them. I honestly think they don’t even see the garden. It just doesn’t register. Last summer I managed to get Brendan to mow the lawn in exchange for money. But for the most part, it’s just me versus the garden. My neighbor makes it all look so effortless. She has planted her garden without the help of landscapers, bit by bit, as she has been inspired. Tons of amazing flowers bloom all the time. She has raspberries. Rosemary. Sage. It’s all so beautiful. She can go to the nursery and come home with just the right plant, put it in just the right place, and it will thrive. She can be gone for weeks at a time in the summer, and the garden looks just fine. I go to the nursery, wander the aisles, get overwhelmed with the possibilities, unable to picture anything at all in my own garden, leave with a packet of basil seeds (thinking about pesto), go home and curl up on the couch with a book. I leave for three days and weeds the size of baby redwoods sprout on the south-facing slope. Oscar came today, to do a little spring pruning. I am amazed at how hardy these plants are. We didn’t have much of a winter this year, but we had some good snowfalls in December and many days below freezing. Nonetheless, the parsley is thriving and the lavender along the street is looking like it will survive, even though I pruned it way too late last summer. The garden looks like it might forgive me, once again, for my ignorance and ineptitude. The daffodils, bless them, come up every year, no matter what I do. They’re the best part of the garden – the miracle of matter from nothing but sunlight and water, the promise of warmth and color and beauty – and most importantly, there’s as yet no indication of the weeds and chaos that will take over the garden (and my psyche) in the weeks to come. Time to gear up for another season of gardening! This entry was posted in Gardening, Philosophy, Science and tagged weeds by gydle. Bookmark the permalink.